When a game has a story and involves sentient creatures, it is inevitable that dialog will arise in some form. But there are different forms of dialog and different ways to handle the dialog in more or less respectful ways to the dialog itself. But if there is effort being made to create the dialog, shouldn’t we always strive for the best? But what is the best for a given situation? I argue there is a gradient of successful ways to have dialog in games. No one answer is inherently the best, but there are definitely some practices that should cause a designer to think twice. While writing this, I found the article got rather long, so this is split into two parts. Part 2 talks about using the mechanics discussed here in games for better or worse. 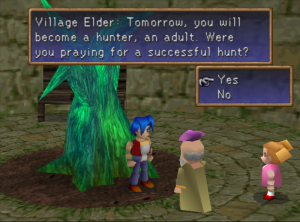 Not to say that there isn’t room for improvement here, but there aren’t many choices that game designers face when looking at how to bring dialog into their game. This isn’t to say there aren’t actually a couple of more unique outliers (like this adult targeting game which used minigames to drive dialog), but I find talking about what we see every day more interesting for the pros and cons. 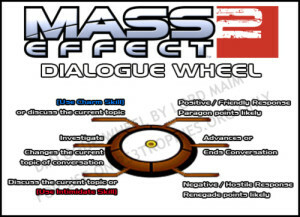 After all, a completely unique system to one’s game might be perfect or terrible, but the uniqueness makes it harder to evaluate before execution (in that example, it was claimed the games were too distracting to actually listen to the dialog; I didn’t play the game so cannot personally comment). Dialog is coming from someone’s verbal skills even if it is a written note, so doesn’t it improve the immersion if the source of the talking or writing reads it back to the player? Well, generally yes. This can bring the difference between reading a play and listening to an audio recording of it presented by trained actors. There is a lot of emotion and personality that actors can bring to the party. The problem is that actors can bring emotion to the party, but they might not. In the end, acting is a skill that tends to be learned and honed over time. There is a difference between listening to say Liam Neeson or Mathew Perry versus others. Dialog that feels a bit off textually can be skipped pretty quickly, but poorly delivered lines hurts a scene much more. And getting good actors costs money beyond just the audio studio time. Sometimes there is a diamond yet to be discovered which can keep costs down (like having Logan Cunningham as a friend), but more times than not, there isn’t. So unless your game has the budget for actual actors, maybe another approach is better than risking people laughing at your lines. The default cheap approach is to just display text one way or another. After all, the lines are text anyway, and you would have been providing subtitles. Having just textual displays for dialog definitely cuts down on production cost, but what is the cost to the end result? This definitely will differ from person to person. I remember reading (but cannot find a link) that voice acting was added to Final Fantasy X because one of the leads working on it had shown his father a previous game and his father asked why he couldn’t hear the characters. Similarly, I was playing games before I could read. This meant I could only play adventure games that talked which limited my choices. But most gamers can read and are willing to. Timing becomes more difficult to establish, but, like reading a good book, isn’t essential when all else holds up. I’ve even seen games like Final Fantasy IX have timed text reveals to try to establish more exact timing of lines (with varying success, but it tends to not actually detract from the dialog). So, while it does put an onus on the writers to do a better job, it is a completely viable approach. That said, I have a nit pick with text displays which honestly can ruin a game for me. They absolutely must make some sort of sound when the text either starts, is displaying, or you select to move on. I don’t mean any sort of interesting sound being required. Just something. This missing where, like in Child of Light the music just became softer, makes me not want to read the text. My brain cannot focus as much when the rest of the game uses sounds to guide my attention. 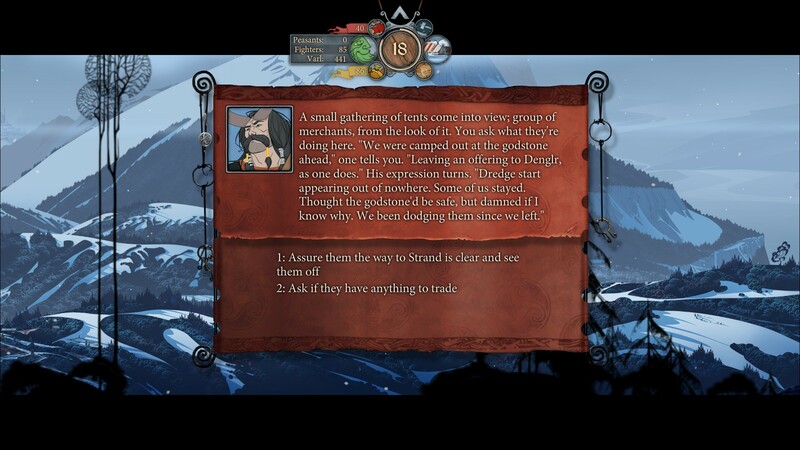 I actually gave up on The Banner Saga because of this (potentially other things too, but this was a non-small part of my lacking immersion). There was lots of text and talking which would just appear. The only sound I got with it was the click of my mouse button. I simply could not focus on the words which were the entire way the story was presented. And without a story, an RPG tends to start to stumble. When 3/4 of your time is spent not being engaged by text, 3/4 of your time is boredom. My comment about wanting sounds does bring up a unique hybrid I have experienced and really liked. To set the stage, I tried to like Fire Emblem Awakening, but there was huge problems in the story and gameplay that just seemed to be looking to make me not have fun. In the end, I really disliked the game. But one thing it did that I loved was how they presented dialog. Whenever a line of dialog was presented, a voice actor had a word, phrase, or even just sound that was presented. For instance, if a character was questioning the soundness of another character’s plans, you might hear “I don’t know…” as the text started. This set the mood for the text surprisingly well in my opinion. By having many short phrases, they successfully avoided repeating the same verbalization and becoming boring while still saving space on the game install, money with recording, and still set the emotion of a line successfully. I’ve never run into another game that did this I can remember, but it really should be more popular. UPDATE: I’m trying out Wildstar which does something similar. They have an awkward mix of verbalized text and not. The strangest is that they have sometimes multiple sentences of verbalized text that, at best, is tangentially related to what the character is saying. This is distracting and jarring to me; I feel they would have done better to keep all of the characters’ verbalizations very short so they are never the dominant focus of attention when they are not providing the same information. Most fundamentally, dialog begins and then it ends. What happens in the middle is where the player is reading or listening and possibly doing more. In the most basic case, that is all the player is doing. This isn’t necessarily bad though. Just like movies are not hurt by the lack of viewer interaction, this puts all the control into the creators hands. Characters can be much more consistent in behavior (and therefore personality) if their actions are controlled rather than constantly changing. Additionally, from a time and budget standpoint, a linear path is easier to make wonderful and perfect than a spider web of possibilities. Most fundamentally, having no player interaction during dialog should not be seen as a bad thing or that something is missing. If done right, I feel it is the most powerful way of presenting dialog from a story’s perspective. 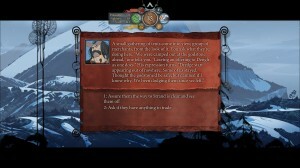 The first addition to interactivity comes in the form of prompts. This means that the dialog is largely linear, but occasionally a player is asked a question. These can be just yes/no questions or full riddles that need to be solved. I’ve seen these prompts mean absolutely nothing (from a yes/no prompt where selecting one just causes the dialog to loop until you pick the other) to single lines of dialog changing to Easter eggs to being branches in how a game plays out. What makes them different from the trees and webs below is they are not common. Overall, I feel this is the worst choice for how to let a player interact with dialog. It always feels to me like I just got an alert box on a web page since it isn’t common. Additionally, it doesn’t really feel like you are participating in the dialog for the most part yet you still have to make a choice. I feel an element should either embrace being interactive or just not be interactive. These can also have the problem where the user isn’t really paying attention and accidentally selects something because they are so used to just clicking when they are done reading. I do think they can work in a humorous environment. There, immersion is less important, in my mind, and irony can really be a benefit. These pair well with the choices that don’t actually matter or Easter eggs, but humor is complicated anyway. Really prompts should just be avoided for a better system. I think of dialog trees as the system that adventure games tend to have. They tend to be a list of topics where a user can follow up on any of them and drill down into certain categories. There are a lot of branches, but they generally are not exclusionary (as in, picking one doesn’t prevent you from picking the others). Webs are, in my mind, similar but are more driven by a linear series of interactions where the user is given several responses. This is frequently how moral choice comes into dialog because good, bad, or neutral responses will sit in the web. I also characterize webs as not allowing the player to go back meaning selecting one option does prevent the character from choosing the others (web may be a bad term for this; a system of valves would be better, but is a more complicated metaphor). For direct dialog interaction, this is the only way, I see, to make dialog truly a primary part of the interaction. The user needs to have choices that they feel matter or can be used to characterize who they are roleplaying. This does mean that, as writers, all choices have to be equally as valid to the story and therefore generate exponentially more dialog paths. This does really let a player roleplay. Morality coming into this drastically reducing roleplaying though. In most games with morality, there is not benefit to a middle ground though. It is much better for the player to either always choose the morally good answer or always choose the morally bad answer. Usually, there are effects of these moral choices (or else why would the choice exist?) that only will trigger toward the end of the game for a player who is drastically in one camp or the other. Neutral players tend to, at best, get a fairly neutral ending and alternatively get the default “not the best ending” reward. Stay tuned for part 2 where we will discuss how using these mechanics well or poorly can mean the difference between dialog being a first class citizen and a third class citizen.